Driven by compressed air, pneumatic tools are compact and lightweight. 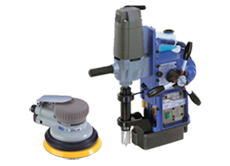 These tools possess high torque and easy control of speed and power. Nitto Kohki currently offers 35 major pneumatic tools. Please select your application to view relevant products. State-of-the-art tools pursuing ultimate functionality. Full line-up of "Task-force" models completely meeting on-site needs. We have developed lightweight, easy-to-use, powerful, efficient and high quality professional tools. By exploiting the advantages of hydraulic power, Nitto Kohki has introduced a series of safe and compact hydraulic tools that can be used for a variety of processes for steel.